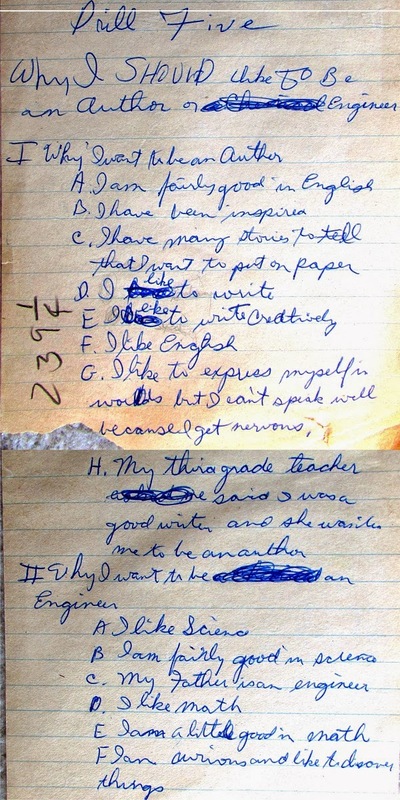 Fifth or sixth grade exercise, late 1950's. It was more about the mechanics of outlining. But the words were prophetic. "Out of the mouths of babes." If you want to be a writer, don't quit your day job. I was barely out of the womb - nine or ten years old - when I knew that I wanted to write. And very little has changed since. Even at that tender age I knew that the writing life was one of sacrifice and deprivation. So I covered my bases by choosing a more lucrative profession - that of my father - even though I was only 'a little good' in math and handicapped by my aversion to public speaking. Fifty five years later I cannot express my personality more eloquently. I can retract not a single word of this. I never excelled at math. I succeeded in science by my wit and cunning, and by my ability to defend my science against hostile reviewers with my skills with the written word. My craving was always to write. In the final analysis I did both. During my NASA career I combined science with prose and managed to publish dozens of peer reviewed articles in Internationally recognized Scientific Journals. In retirement I became a Science Fiction writer, applying my extensive science knowledge and embellishing it with the Fantasy and Mysticism that was flowering in my blood. The writing life has great allure for the younger generation, as it had for me back in the late '50's. There are no overt barriers. If you can type, if you are literate and overflowing with ideas, then you have a chance to become famous. The profession is open to anyone who wants to give it a try. But to those of you who propose to be writers, this is not necessarily good news. It means that the competition is fierce. You're up against every other 'wannabe.' You better get a day job. There are perhaps a few dozen Sci-Fi/Fantasy writers who can eek a comfortable living at this profession. I have a government pension on which I can depend. So I am free to roam the wild realms of imagination and wrap my tale in rich layers of narrative. My 'world building' has transcended decades. I aspire to attract readers to my tale, not to make money, but to introduce them to this Fantasy world's truth and beauty, and its relevance to our living world. I agonize over the quality of my prose because I know my readers have more choices than they have ever had before. I strive to stand above the crowd. 'Eden's Womb' is an epic fantasy with strong elements of solid Science Fiction. Best of all, it's a rousing adventure/quest story - an odyssey. I try to devote careful attention to character development, to character-arc, and to vibrant dialogue. Give it a read. I don't think you'll not regret it.